On paper it may seem as though this blog has been severely neglected. I confess it’s been a week since my last post and I haven’t even cooked a piece of toast in that time. Obviously I have still been eating and you can bet I’ve been sacrificing stomach space for the glory of a good story. Yes, I’ve been busy doing some intense field research…also known as vacation! Those of you following on Facebook know that I’ve been gone to New Orleans Louisiana, the birthplace of jazz and one of the most intense food meccas in the United States. By air, the city looks much like every other city in the US; neat sprawling suburbs, warehouses, ribbons of busy highways and roads, and inner city rows. Until you notice many of those neighbourhoods are built near marshes and swamps and are surrounded by canals and river offshoots of the Mississippi River. 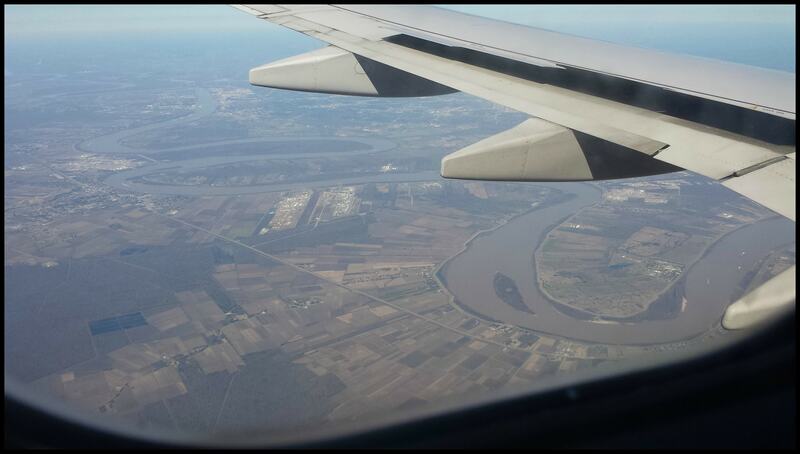 I saw many water ways from the air but when I first saw the Mississippi, I knew right away that the heart of the state was the Big Muddy. So wide and flat, meandering, muddy brown, slow flowing, and unassuming. The residents know first hand that their beautiful river is anything but unassuming. Driving through the city you can take a closer look and see that many of the neighbourhoods are still rebuilding or even entirely abandoned from the severe flooding in 2005 that happened when hurricane Katrina devastated the Gulf region. Hurricane Katrina was the costliest and fifth deadliest natural disaster in the history of the United States. Though the damages were not limited to the city of New Orleans, there was a big push to fund the restoration of the French Quarter to preserve the history and ensure that money would continue to flow in from tourism. As expected there was a lot of miss appropriation and mishandling of money. The hotel we stayed at, Grenoble House, just reopened in October 2013 because they had to sue their insurance company to replace their missing roof and fix other damages. As we walked along the streets of the French Quarter, we could see many places still needing major repairs and many businesses still remain closed. One thing that can never be replaced is the Southern spirit of the people of NOLA. We met and talked to many people, happy to be alive and living in the city they love. After dropping our bags off at our hotel we left on our first walk through the French Quarter. 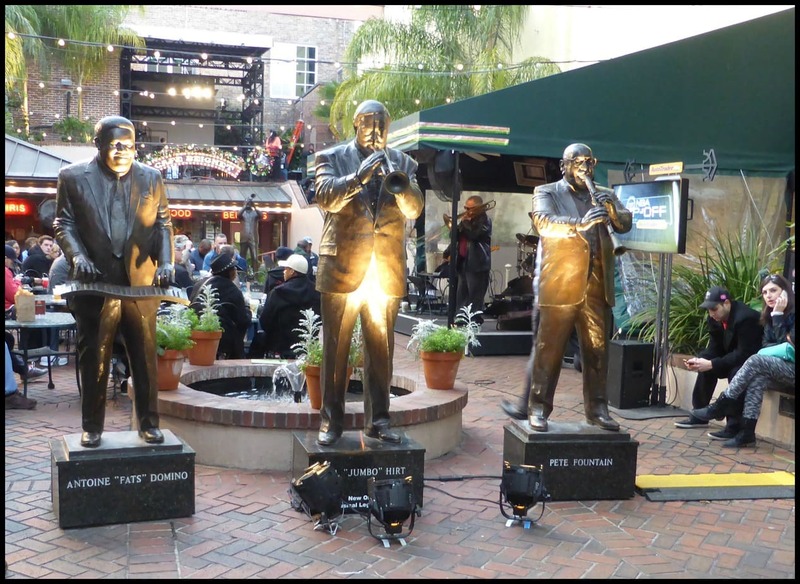 We ended on Bourbon Street (up as one does) in the middle of a large crowd of people waiting around at the entrance of Musical Legends Park. One guy told us everyone was waiting for Shaquille O’Neal to show up for the All Star Tip-off basketball show filming. We stood around for a while and then walked into the park where we miraculously found an empty table. There we enjoyed our first sound of NOLA jazz, Southern cocktails, and some delicious (but messy!) beignets from Cafe Beignet. I had a Gin Fizz and hubby had a Mint Julep. Sometimes I like to bug him that he is a girl drink drunk…. The beignets were not what I was expecting. They were pretty dense and chewy but even so we managed to power through them. Luckily the drink was even better! Eventually Shaq showed up and kid number one got so excited he jumped up and spilled his entire sprite. The server was really nice and brought him another one. 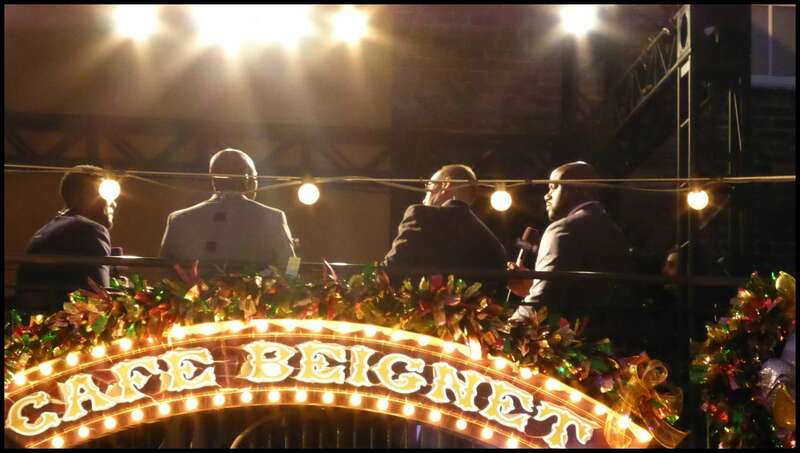 Here’s a rear view of the show being taped up on the balcony of Café Beignet. After that bit of excitement we found our way to GWFins for our 7pm reservation. Bahaha. Mint Julep. That’s offing hot!! Happy holidays my friend. Great post! I didn’t love the food of new orleans, and I’ve been there twice. We did eat at a couple of great restaurants, and of course the food was fabulous there, but the everydaty food seemed all to have sugar added to it. oh well. hmmm. I didn’t notice a lot of sugar, other than the beignets of course. We enjoyed the Po’Boys we had even though we generally don’t eat white bread and I didn’t notice them being sweet. Lovely photo of the jazz legends and it’s hard to believe that Katrina was almost 10 years ago!! I’ve never had beignets from that place and I haven’t had Café du Monde in a while. The French Quarter is too taxing to navigate, even for a native. 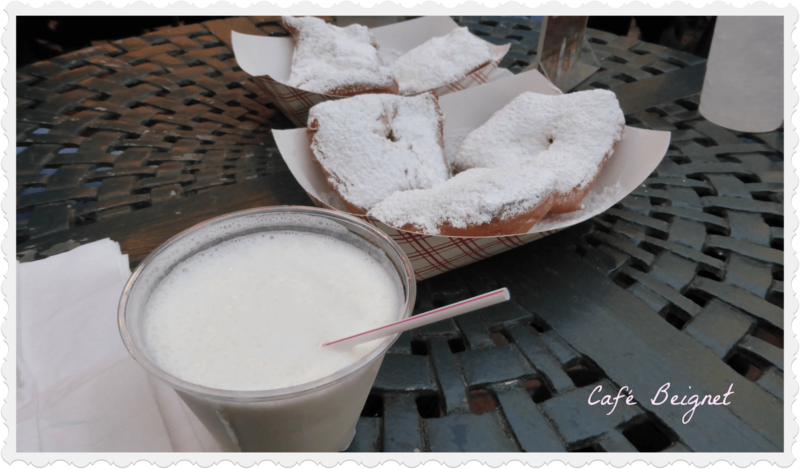 But, Morning Call has great beignets! 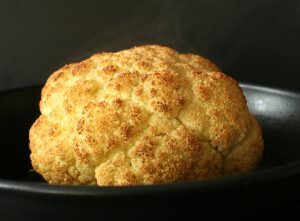 Light and fluffy on the inside, warm and crispy on the outside. Delicious! Hope you’ll come back and try again. Thankyou! I thought it was just me….I was completely turned around the whole time. And every time I passed a place and decided to go there later I could never find it again. Sheesh! And imagine doing that after a few cocktails.. 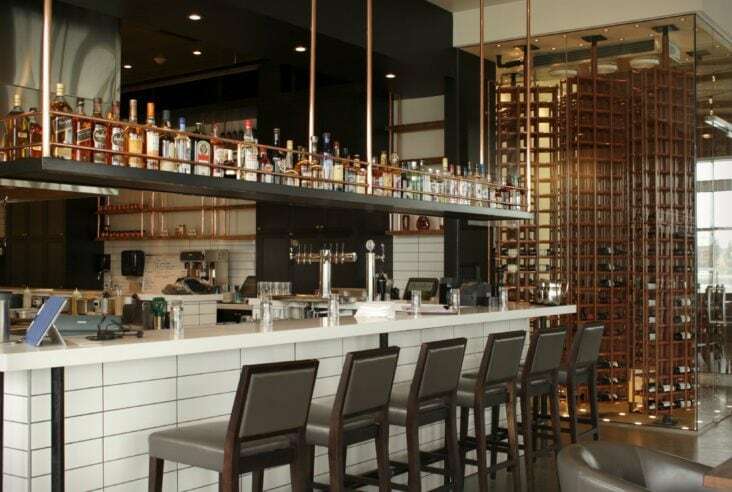 Yes, NOLA is good for getting people drunk or loosened up, whichever is your fancy!